Thumbprint cookies… A versatile cookie that traditionally has a shortbread base and an indent in the center filled with jam, chocolate, dulce de leche, or for today’s cookie, a key lime chocolate filling. Don’t worry its white chocolate, not semi or milk chocolate. I definitely don’t think these cookies would be as appetizing if key lime juice was mixed in with either of those chocolates. Somehow I think the key lime flavor would be lost. Now, as a filling for a truffle I think it would be perfect. I may have had one or two of those before so I am speaking from experience. I have a friend who has all of a sudden fallen in love with Key Lime Pie. I’ve been making it for a few years now but all of a sudden when I made it last year it was like he was eating it for the first time. And when I asked some friends what cookies they wanted for Christmas last year (just over a month ago sounds so much better to say this early in the year) he suggested rugelach and a key lime pie. Which got me thinking of a key lime pie cookie since I wasn’t in the mood to make a pie (which I ultimately ended up making anyway.) So, I initially made the Key Lime Crinkles that were part of Cookie Palooza. While they were delicious, they lacked the key lime filling he enjoys so I knew I would have to try these thumbprints instead and I am happy to say that these were a hit with everyone who tried them. A cookie that will definitely be in my cookie rotation. Thanks to the graham cracker crumbs in the base of the cookie this is almost like enjoying a piece of key lime pie, but, in a bite size grab and go form. And while the key lime flavor is apparent in the filling I could imagine adding another tablespoon or so would kick it up even more. Combine the butter and sugars in a large bowl and beat on medium speed until creamy. Switch the mixer to low and add in the egg yolk and vanilla extract and continue mixing until well combined, scraping the sides of the bowl as necessary. In a separate bowl which together the flour, graham cracker crumbs, cornstarch and salt. Gradually add the flour mixture to the butter mixture, mixing until the ingredients are incorporated. Scraping the sides of the bowl as necessary. Using the back of a rounded teaspoon gently press an indent in the center of each ball. I have tried using my thumb for this step, but, have found that a teaspoon produces a much better circular shape. Chill the dough in the freezer for at least 30 minutes. Freezing the dough prevents the cookie from spreading too much while baking giving you more room for your filling. Bake the cookies for 10-11 minutes. Immediately after removing the cookie from the oven press the teaspoon into the indent once again to redefine it. Let the cookies cool completely on the sheets before filling them. To make the filling… Combine the chocolate chips, condensed milk and key lime juice in a small saucepan and cook over medium-low heat. Stir frequently until the chocolate chips have melted and the ingredients are well combined. Stir in the lime zest and continue stirring until the mixture begins to boil. Reduce the heat to low and using a teaspoon spoon the filling into the cookies. Allow the filling to cool and set before serving. When storing the cookies, keep in mind that the filling may remain a bit tacky. Store in an airtight container at room temperature. Are you all set for Christmas? Are your gifts wrapped? Cards in the mail? Cookies baked? Or, are you looking for just one more treat to make? If so, you should try these Chocolate Truffle Cookies. 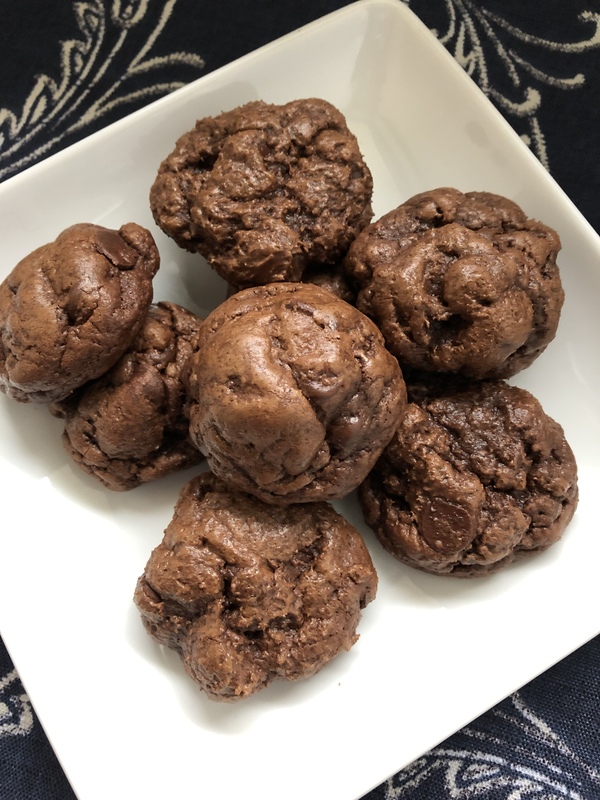 They are chocolaty without being overly sweet thanks to the addition of unsweetened chocolate, which helps to offset the sweetness of the semi-sweet chocolate and sugar. One thing you will definitely need to make these cookies is time. Once the batter is made it needs to be refrigerated for at least 3 hours so it can become firm enough to handle, but, it’s worth the time. The final result is a cookie similar to a truffle, firm on the outside and soft on the inside. 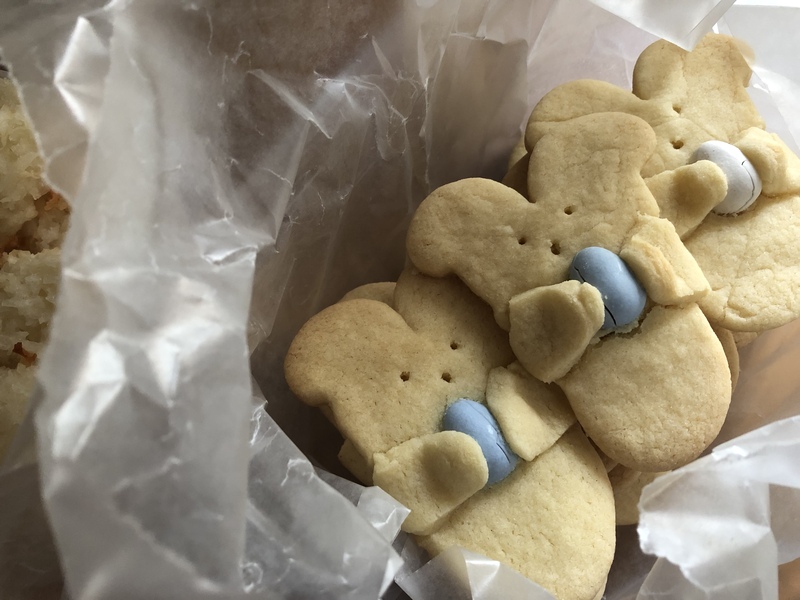 These cookies were part of a box of treats I mailed to a friend. Included in the box were the Chocolate Covered Pretzels and Candied Nuts I posted about earlier this week. Also included were Peanut Butter Blossoms. All wonderful homemade treats to gift to anyone on your list and can easily be made this last weekend before Christmas. In a microwave, melt 1 cup of the chocolate chips, unsweetened chocolate and butter; stir until smooth and let cool for 10 minutes. In a large bowl beat the sugar and eggs on medium speed until well blended. Beat in the cooled chocolate mixture and vanilla extract. In a separate bowl whisk together the flour, cocoa, baking powder and salt. Gradually beat this into the chocolate mixture. Once fully incorporated stir in the remaining chocolate chips. Cover and refrigerate for at least 3 hours. Preheat the oven to 350 F and line 2 baking sheets with parchment paper. Using a cookie scoop, scoop the dough (it will be quite firm) and then roll into a ball and place on the prepared baking sheet. Bake for 10-12 minutes, until cookies have puffed and are set. Cool on the pan for 3 minutes and then transfer to a wire rack to cool completely. Dust with confectioners’ sugar, if using. 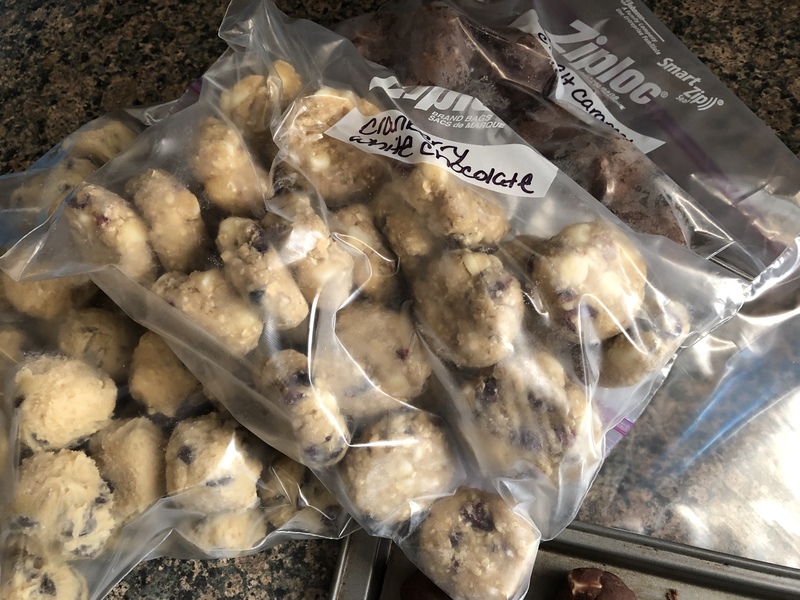 I knew I would be pressed for time this year when it came to baking cookies for Christmas, so, I decided to do something I’ve never done before and was always skeptical of doing… freezing cookie dough. I normally have a good day or two to bake, but, the way things are falling this year I am only going to have one good full day to bake all of my cookies and I just knew that it wouldn’t be enough time due to the fact that I have a few other things to take care of that day as well. So, currently there are about 6 or 7 different batches of drop cookies in my freezer along with the dough for these Checkerboard Cookies . And, there is also a batch of Gingerbread People ready to be popped in the oven. I also went out and purchased some extra-large baking sheets. I am sure you have seen them, the Wilton Mega-Sized Baking Sheet. As you can tell, I am serious about baking these cookies in record time. So, let’s talk about freezing cookie dough. Were or are some of you skeptical like me about it? Or, is it something you have been doing for years and are shocked to read my apprehension about it? The best cookies to freeze are drop cookies and slice and bake cookies. You can also freeze the dough for roll out cookies (sugar cookies, gingerbread people, etc. ), but, I would suggest rolling out the dough and cutting it into your desired shapes first and then freezing it. That’s exactly what I did with the Gingerbread ones. 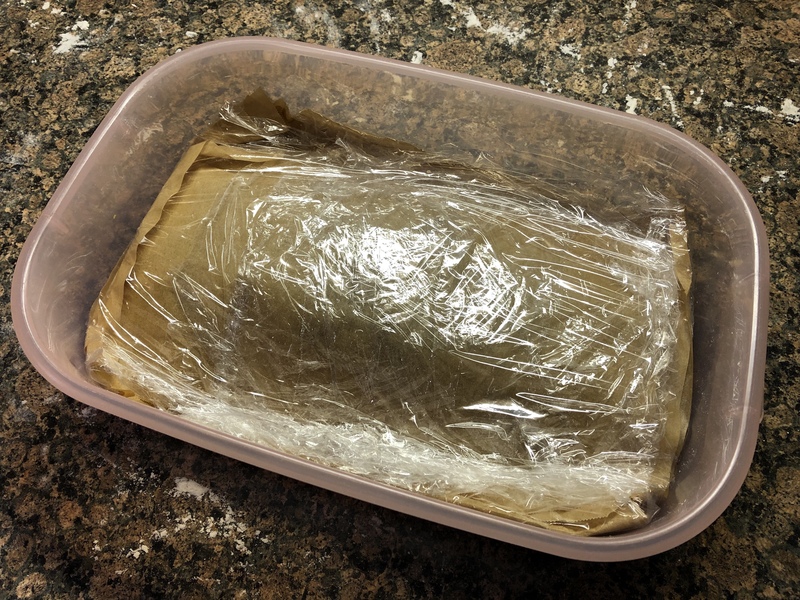 Using a freezer-safe container, I lined it with two pieces of plastic wrap lengthwise and widthwise leaving a few inches of overhang. I layered the cookies in the containers making sure they were flat and placed a piece of parchment paper between each layer and on the top layer. Once filled, I wrapped the plastic wrap over the top layer making sure to press out any air. Topped the container with the cover and placed it in the freezer. You could freeze the entire disk of dough as well, but, I personally think that the time spent waiting for it to defrost would be better spent just making the dough to use immediately. 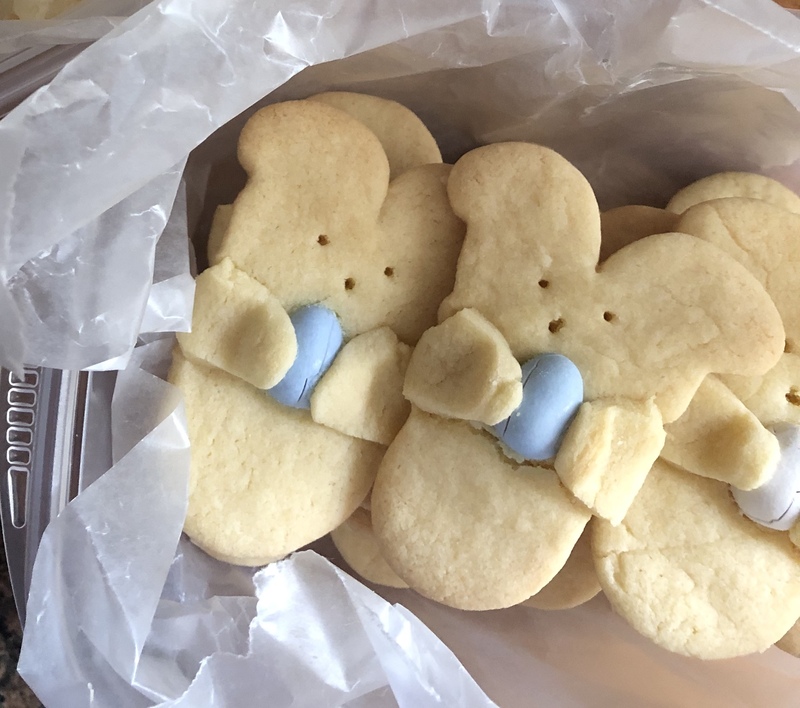 My plan for these is to let them thaw a little and then press mini M&M’s into them before baking and then ultimately decorating them with royal icing. Back to the drop cookies and slice and bake variety…. 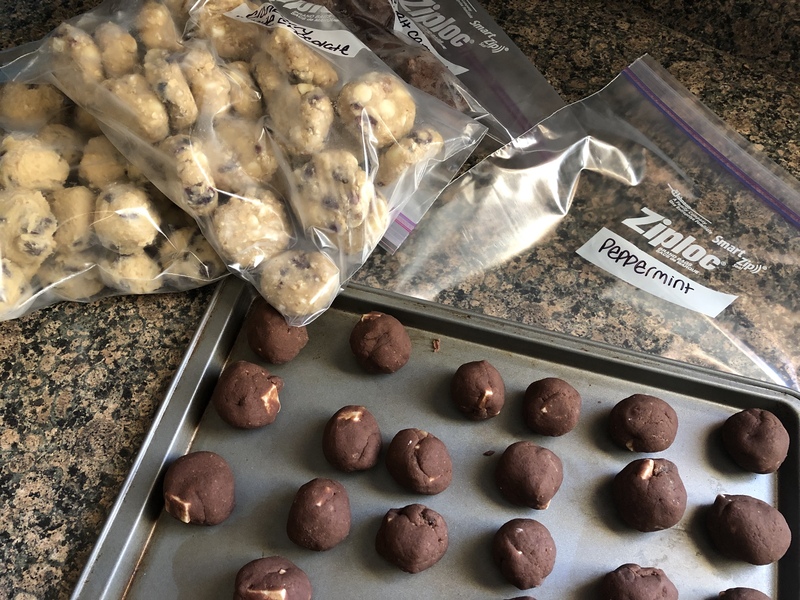 For the drop cookies I simply made the dough, rolled the dough into balls (scooping it with a cookie scoop) and then placed it on a baking sheet. Since the dough was going in the freezer and not in the oven I was able to place the dough really close together on the baking sheet. I just made sure none of them were touching which could ultimately lead to them freezing together. I then placed the sheet in the freezer for a few hours until the dough was thoroughly frozen. Once frozen, I transferred the dough to a freezer-safe plastic zip bag. I labeled the outside of the bag with the type of cookie it was. Since I wasn’t planning on leaving it in the freezer too long I opted not to include the date, oven temperature and baking time on the bag as well. The suggested length of time for leaving dough in the freezer is 3 months. I actually baked a batch of one of the cookies this weekend and I am happy to say it was a success. To bake them, I placed the dough on a parchment lined baking sheet 1 to 2 inches apart and increase the suggested baking time by 1 to 2 minutes to account for the dough being frozen. The cookies baked perfectly and tasted like I had just made the dough that morning. That’s really what my fear was (and still is to a certain extent), that the cookies will somehow have a weird flavor from the dough being frozen. For the slice and bake cookies, you can follow your directions and form the dough into a log, wrap it in a few layers of plastic wrap, place it in a freezer-safe bag that has been labeled and then freeze it. It’s not necessary to refrigerate the dough prior to freezing as most slice and bake cookies require prior to slicing. To bake these cookies, let the dough sit at room temperature unwrapped for 10 to 15 minutes. The dough should feel cold to the touch, but soft enough that you will be able to slice it. Slice and bake per the directions, once again adding an additional minute or two to the time. Since my test batch was a success I am little less unnerved by the process. Fingers crossed I will still be singing high praises come Sunday when I bake quite a few more batches. How about some crinkles for Mr. Kringle? Sorry for corniness, but, I couldn’t resist. 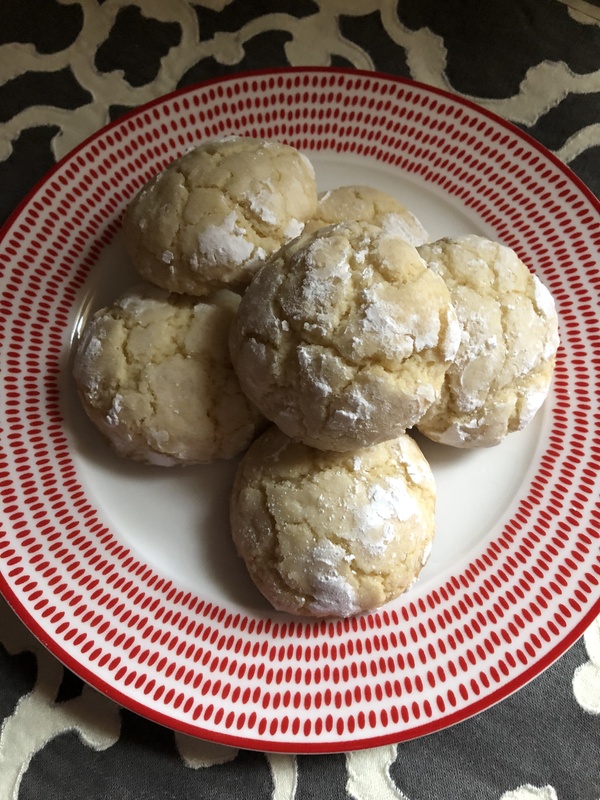 While crinkles are customarily a chocolate cookie I decided to switch things up a bit and bring you Key Lime Crinkles for the last cookie of Cookie Palooza week. And in case you didn’t know, crinkles are a drop cookie that is rolled in confectioners’ sugar prior to baking. The sugar draws moisture out of the cookie while it’s baking allowing the cookie to crack and dry out. Leaving the exterior of the cookie with a bit of a crust and the interior soft and yummy. This key lime version is a great cookie for someone who wants something sweet but not with all the decadence of chocolate. The search for these cookies came about because I recently asked some friends what cookie they wanted for Christmas and one friend said rugelach and a key lime pie. So, I started searching for key lime cookies since I wasn’t planning on making a pie during my weekend of cookie baking in a few weeks. 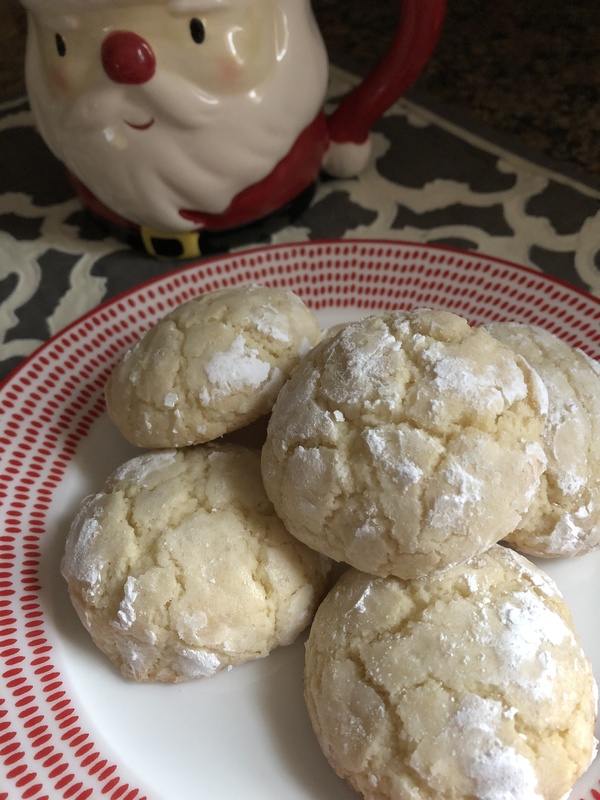 The first cookie I came across was a thumbprint cookie that actually has a key lime filling, I was all set to make that one for Christmas and then I came across this recipe and decided that I would share this recipe with you as my final cookie for Cookie Palooza week. While I normally share a no-bake cookie as my final cookie, I just couldn’t find one this year that I liked 100%. My friend who wants the key lime pie tried these and he said that while they are good and they do have the key lime flavor he likes, he was hoping for a key lime filling, a la the aforementioned thumbprint cookie. So, I will be making the pie after all since that is quicker and easier than the cookies. It may be hard to find key limes this time of year, so, you can use bottled key lime juice. I usually find this key lime juice in the baking aisle of my supermarket. This is the same juice I use to make my key lime pie when I am short on time to squeeze key limes, or they are not available at my supermarket. In all honesty, I’ve made key lime pie with fresh limes and with this juice and the taste is exactly the same. And if all else fails, you can use regular limes. I actually used the zest of a regular lime in this recipe. And speaking of zest, if you want more of a lime flavor I suggest adding in more zest. I would avoid adding in more lime juice as that will alter the consistency of your dough. 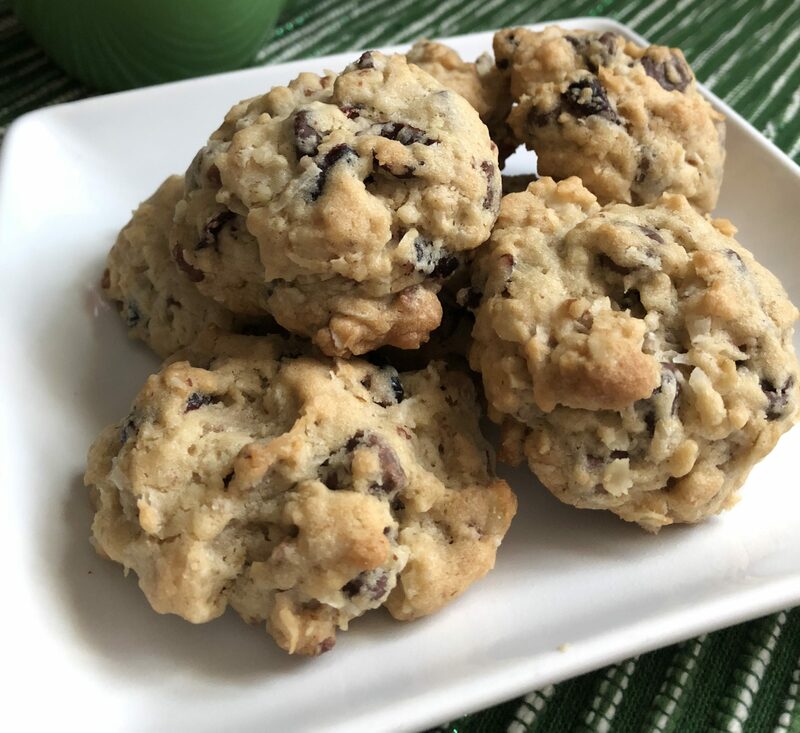 I hope you’ve enjoyed Cookie Palooza 2018 as much as I enjoyed baking the cookies and bringing you the recipes. Check back next week for Holiday Cake Week. 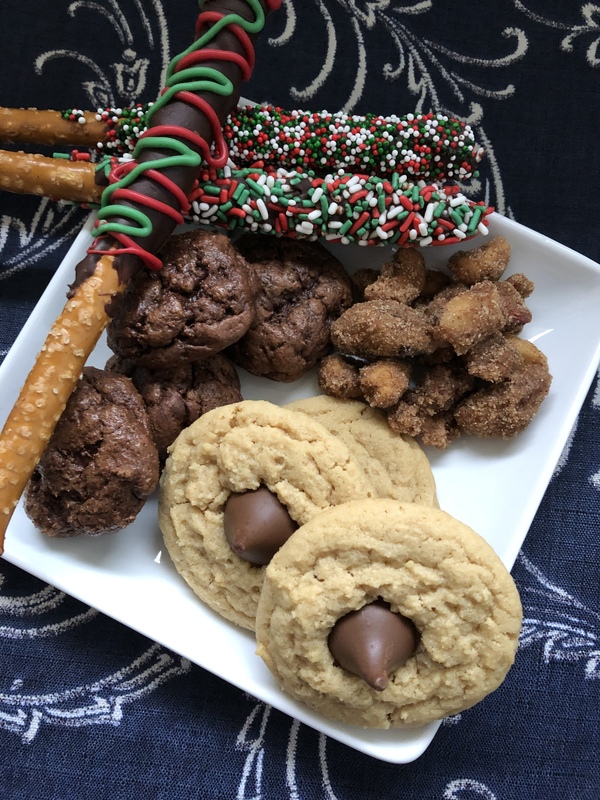 I’ve also got some other Holiday treats hitting the blog soon as well… Chocolate Covered Pretzels, Slow Cooker Spiced Nuts (they are really Candied Nuts) and a Chocolate Truffle Cookie (which I initially was thinking would be cookie #5 for this week). In a medium bowl whisk together the flour, baking powder, zest and salt. In a large bowl combine the butter and sugar and beat with an electric mixer on medium speed until light and fluffy. Add the eggs, one at a time, mixing well after each one. Mix in the lime juice. With the mixer on low speed, gradually add the flour mixture to the butter mixture and beat until just combined. Cover the dough and refrigerate for 30 minutes. Preheat the oven to 350 F. Line two baking sheets with parchment paper. Place the confectioners’ sugar in a small bowl. One chilled, use a cookie scoop to scoop the dough and roll into balls and then roll in the confectioners’ sugar. Place on the prepared baking sheets and bake for 15 to 18 minutes, or until the cookie begin to brown along the edges. Cool on the pans for 5 minutes and then transfer to a wire rack to cool completely. Welcome to day 4 of Cookie Palooza. Today’s cookie is basically a kitchen sink cookie. Don’t worry, there are no food scraps in this cookie, but, there are a bunch of add-ins, hence the kitchen sink analogy. There are pecans, dried cranberries, semi-sweet chocolate chips, milk chocolate chips, oatmeal and coconut. And while I know many people are not a fan of coconut (it seems people either love it or hate it) don’t fear, this cookie does not have a coconut flavor. The coconut adds texture to the cookie. And I am sure I may have lost some of you already as I know people are not always fond of a cookie with texture, especially a cookie like this that already has so much going on, but, trust me, all of the ingredients work so well together you will forget that there may be an ingredient or two you don’t like. Unless you have an allergy to one of them of course. I got this recipe from Food Network’s 50 Chocolate Chip Cookies, and while there were quite a few among those 50 that sounded yummy I opted to make this one because it reminded me of another cookie I like to make around the holidays, a White Chocolate Chip Cranberry Cookie, that I just realized I have never posted about. I’ll have to do that this holiday season as I am sure I will be making it again. Something I did realize though going through some old posts, I need to stop taking pictures at night. Unfortunately I do a lot of baking at night, but, I will have to refrain from taking picture then because they just do not post well. The recipe called for 1/4 cupfuls of dough (about an ice cream scoop size) to make about 10 cookies, I opted to use a cookie scoop to make mine. Which yielded about 30 cookies. A nice amount to gift or to have on hand for a holiday guests. Whisk the flour, baking soda and salt together in a medium bowl and set aside. In a large bowl beat the butter and sugar with a mixer on medium-high speed until light and fluffy. Beat in the egg and vanilla. Reduce the speed to low and beat in the flour mixture until just combined. Stir in the remaining ingredients. 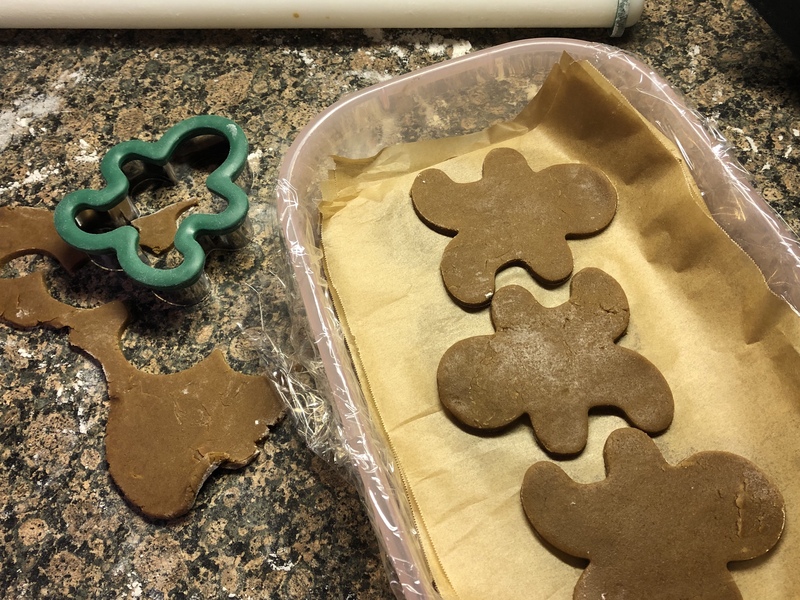 Using a cookie scoop, drop the dough 2 inches apart on the prepared baking sheets. Bake for 12 to 15 minutes, until set around the edges. Let cool for 10 minutes on the cookie sheets then transfer to a wire rack to cool completely. 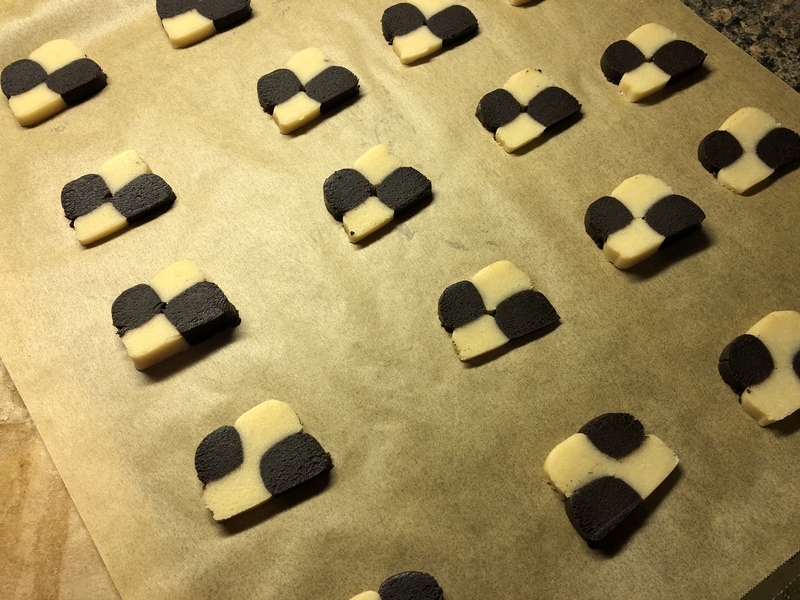 It’s Day 3 of Cookie Palooza and once again I am bringing you a cookie that looks difficult to make but really isn’t, a Checkerboard Cookie. Normally I avoid making slice and bake cookies. Mine never end up looking like a perfect circle, but more like an oval. They taste good, but, the shape is off. I prefer drop cookies and occasionally I will make roll-out cookies. But, I am trying to step up my baking and challenge myself a little more and figure out ways to overcome the pitfalls that I encounter when I try different things in the kitchen. Sounds a little silly since I am just talking about simple cookies, but, it’s a good attitude to adopt to face other challenges that life may throw at you. So, I figured these Checkerboard Cookies were a good way to overcome my avoidance of slice and bake cookies. They are simple to make, are pretty forgiving in terms of their shape once sliced and are pretty impressive looking. To make the dough I combined butter, sugar and vanilla extract and beat it until it was light and fluffy. I then added in flour and an egg and continued mixing until the dough came together. Finally, I divided the dough in half and transferred one half to a piece of parchment paper and left the other half in the bowl I made the dough in. To the bowl I added unsweetened dark cocoa powder and used a rubber spatula to fold the powder into the dough making sure it was fully incorporated and no streaks of the plain dough remained. Next, I divided the plain dough in half and rolled each piece into a 12-inch log. I did the same with the chocolate dough. 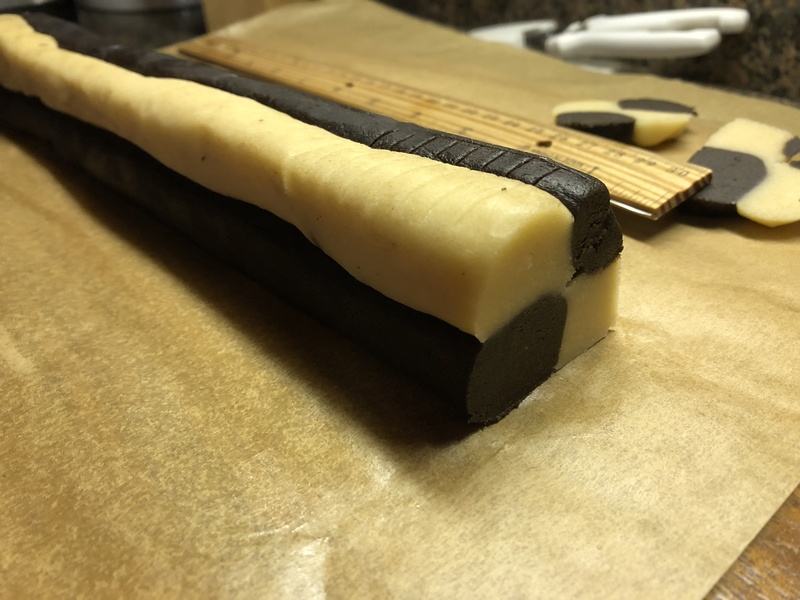 I placed one plain log and one chocolate log next to each other on the piece of parchment paper and then placed the remaining 2 logs on top of them alternating the dough. I then wrapped the dough in the parchment paper and rolled it a few times to smooth the dough and to make sure all 4 pieces were pressed together well. Finally I placed the dough in the refrigerator until it was firm, at least an hour. Once firm, I removed the dough from the refrigerator and sliced a small piece from both ends of the log so it would have straight ends. Next, using a ruler and a sharp knife I scored the dough before actually slicing the cookies. You want to work pretty fast as the dough will begin to soften and your slices will become more oval-like than square as the dough warms up. If this happens you can place the dough back in the refrigerator for a few minutes to firm up again, or, simply flip the log so the bottom is now the top. I placed the slices on a parchment lined baking sheet and placed it in the refrigerator for 10 minutes before baking in a 350 F preheated oven for 12 minutes. 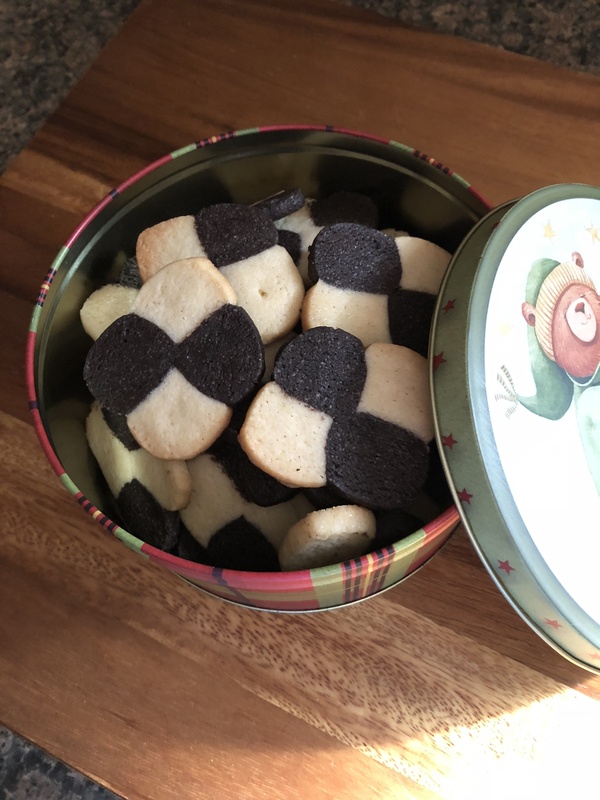 While some of my cookies didn’t have a perfect checkerboard look to them – partly because each of my logs wasn’t the same width – they did taste delicious and the shape wasn’t completely off. 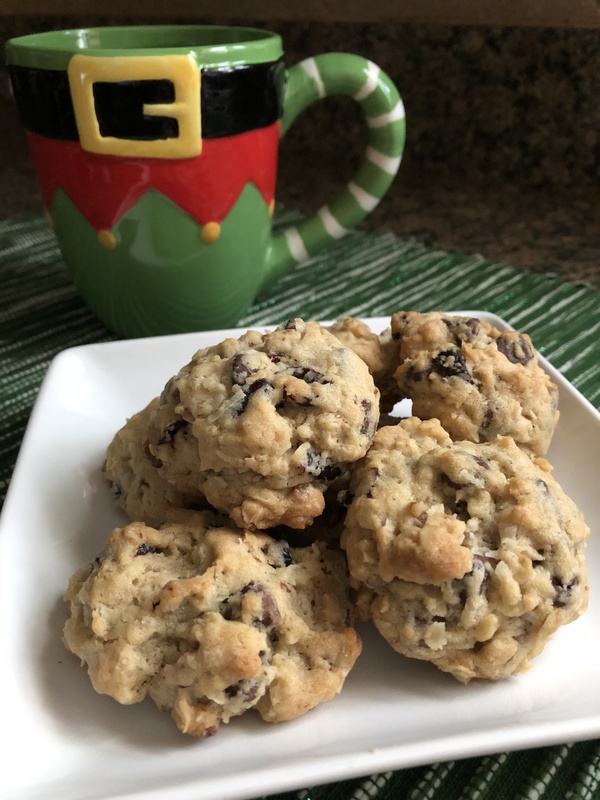 These would be a nice addition to any cookie platter you are making this holiday season. Here’s a fun idea, instead of mixing half of the dough with cocoa powder you could tint one half of the dough red and the other green for a real festive checkerboard cookie! In a large bowl beat the butter, sugar and vanilla extract with a hand mixer on medium speed until light and fluffy, about 2 minutes. Sift the flour 3 times and add half of it to the butter mixture, beating until just combined. Add the remaining flour and the egg and beat until combined, about 2 minutes. Divide the dough in half and transfer one piece to a sheet of parchment paper. Leave the other half in the bowl and add in the cocoa powder. Using a rubber spatula, fold the dough and cocoa powder together until no streaks of the plain dough remain. Divide each piece of dough (plain and chocolate) in half. Roll each of these pieces into a 12-inch log. Place one plain and one chocolate log next to each other on the piece of parchment paper. Place the other two logs on top of them, alternating the pattern to create the checkerboard pattern. The chocolate log should be on top of the plain log and the plain log should be on top of the chocolate one. Wrap the log in the parchment paper and press each of the logs together while rolling and smoothing the edges. Place in the refrigerator until firm, at least an hour. Preheat the oven to 350 F and line two cookies sheets with parchment paper. Remove the dough from the refrigerator and unwrap it. 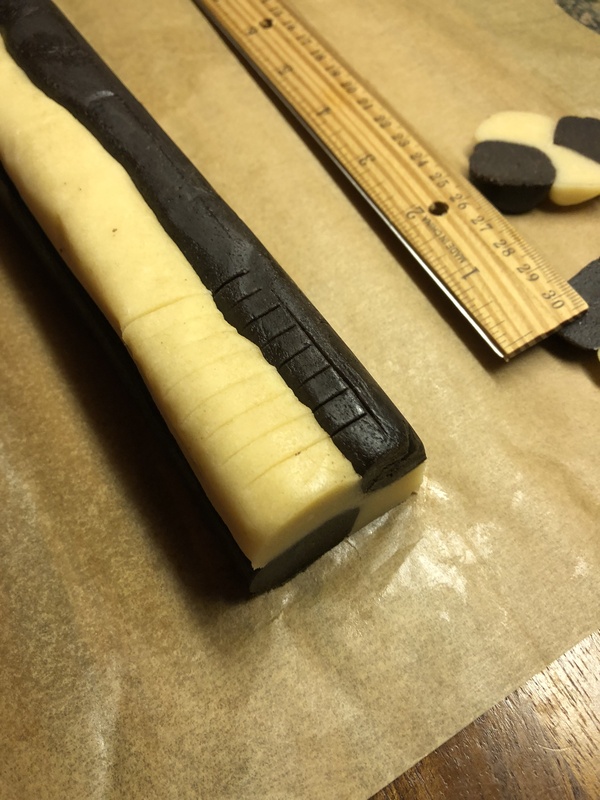 Using a sharp knife (and a ruler if necessary) slice the log into 1/4 inch slices and place on the parchment lined cookie sheet, about 2 inches apart. Refrigerate for 10 minutes. Bake until the cookies are just beginning to turn golden brown around the edges, 10 to 15 minutes. Let cool on the baking sheets for five minutes and then transfer to a wire rack to cool completely. Store in an airtight container at room temperature.